That is the conclusion of a mathematical exercise carried out by researchers in Canada. They say only frequent counter-attacks with increasing force would eradicate the fictional creatures. The scientific paper is published in a book - Infectious Diseases Modelling Research Progress. In books, films, video games and folklore, zombies are undead creatures, able to turn the living into other zombies with a bite. But there is a serious side to the work. In some respects, a zombie "plague" resembles a lethal, rapidly spreading infection. The researchers say the exercise could help scientists model the spread of unfamiliar diseases through human populations. Professor Robert Smith? (the question mark is part of his surname and not a typographical mistake) and colleagues wrote: "We model a zombie attack using biological assumptions based on popular zombie movies. "We introduce a basic model for zombie infection and illustrate the outcome with numerical solutions." "While we are trying to be as broad as possible in modelling zombies - especially as there are many variables - we have decided not to consider these individuals," the researchers said. 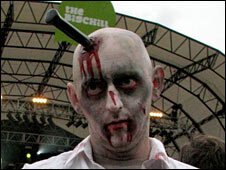 According to the researchers, the key difference between the zombies and the spread of real infections is that "zombies can come back to life". "None of them actually cause large-scale death or disease, but certainly there are some fungal infections which are difficult to eradicate," said Professor Ferguson, from Imperial College London. "There are some viral infections - simple diseases like chicken pox have survived in very small communities. If you get it when you are very young, the virus stays with you and can re-occur as shingles, triggering a new chicken pox epidemic." Professor Smith? told BBC News: "When you try to model an unfamiliar disease, you try to find out what's happening, try to approximate it. You then refine it, go back and try again." "We refined the model again and again to say... here's how you would tackle an unfamiliar disease." Professor Ferguson went on to joke: "The paper considers something that many of us have worried about - particularly in our younger days - of what would be a feasible way of tackling an outbreak of a rapidly spreading zombie infection. "My understanding of zombie biology is that if you manage to decapitate a zombie then it's dead forever. So perhaps they are being a little over-pessimistic when they conclude that zombies might take over a city in three or four days."